Here we go again. Let's just be blunt. There are a lot of things the US Founding Fathers and later judges and politicians got wrong when they created the legal and social standards for our country but refusing to create a state church and generally enforcing a separation of church and state wasn't one of them. I am not religious. The issue with most religions is that many creeds feel that they have a monopoly on "truth". I totally get that. I disagree but as long as they don't bother me I won't bother them. But in some countries, and Pakistan is one of them, there isn't quite a relatively robust separation of church and state. Religion may not run the state but it has entirely too much influence. In the US or most of what's referred to obliquely as "The West" if I want to make a movie or write a book mocking Jesus or making fun of Moses or criticizing Muhammad I can do so. I may be insulted or mocked in turn but generally speaking no one is going to try to burn my house down. Police won't charge me with blasphemy. No one will try to shoot my wife or children. You can't say the same about Pakistan. In fact you don't even have to have been convicted of committing "blasphemy", just have someone in the majority group (Sunni Muslim) accuse you of having committed blasphemy and the lynch mob is ready to go. Fearing for their safety, hundreds of Christian families fled the area overnight.Khan said the mob returned on Saturday and began ransacking Christian homes and setting them ablaze. He said no one in the Christian community was hurt, but several policemen were injured when they were hit with stones as they tried to keep the crowd from storming the area. 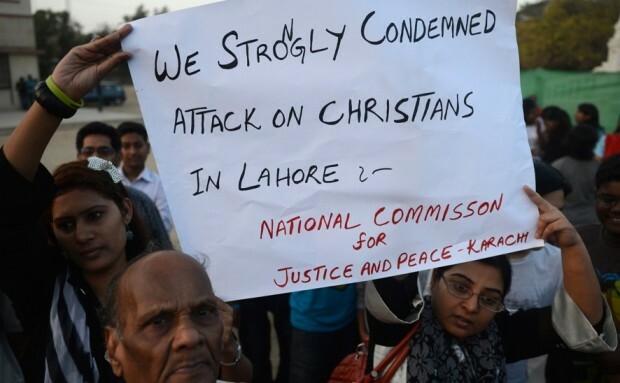 But Akram Gill, a local bishop in the Lahore Christian community said the incident had more to do with personal enmity between two men — one Christian and one Muslim — than blasphemy. He said the men got into a brawl after drinking late one night, and in the morning the Muslim man made up the blasphemy story as payback...Only in Christian cases will violent mobs punish the entire community for the perceived crime of one Christian...Two prominent politicians were assassinated in 2011 for urging reform of the law. The killer of one of the politicians was hailed as a hero, and lawyers at his legal appearances showered him with rose petals. Unfortunately in places like Saudi Arabia or Pakistan or other portions of the Muslim world freedom of speech and freedom of religion are not considered to be important human rights. They are often though to be dangerous foreign imports. Well the world is a big and often ugly place right? It's full of countries that don't have US values and don't want US values thank you very much. 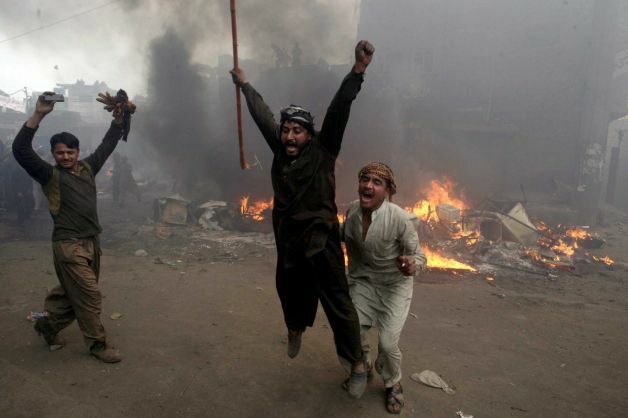 Why should we in the US or the more rational parts of the planet care what a bunch of Pakistani morons do? Well we should care because injustice anywhere in the world is wrong and should be challenged. Although the particulars are different the underlying human evil is the same. The majority seizes on a flimsy pretext to bully, humiliate and occasionally kill the minority. On that level it's no different than what might have occurred in 1920s Alabama or in several other places or times around the world. In-group, out-group: the names change but the game is always the same. We should also care because the sorts of people who think that blasphemy is a serious crime are not content with either staying in the backwaters of Pakistan or having blasphemy laws only apply in similarly benighted places. No. Not only are some Muslim immigrant communities in Europe aggressively seeking to have blasphemy laws reinstated there, some majority Muslim countries are attempting to create an international standard blasphemy law. Although I think every human being on the planet is of equal worth, more or less, every idea isn't. Blasphemy is incompatible with freedom of speech, freedom of religion, the freedom to think what you want to think or say what you want to say. Although I think for simple politesse it's usually best not to insult people needlessly the fact remains that some people (a small violent minority?) in the Muslim world tend to take almost any statement about Islam that's not cloyingly complimentary as an insult. This is no good. There is no reason in my view to grant Islam deference that I wouldn't grant other religions. And a rioter's veto is not a reason. Pakistan's ambassador to the US was accused of blasphemy. It's insane. Blasphemy is a stupid idea promulgated by stupid people. The idea that your God needs the state to protect him is asinine. Obviously there are plenty of people throughout the Muslim world who recognize this, perhaps even the majority of Muslims. I think that most people are basically good. It's important that we stand firm against blasphemy laws and shine the light of truth on to what is essentially state sponsored bullying. I think that Pakistan and Saudi Arabia and other such places need an Enlightenment or Reformation. But only Muslims can lead this. Until then it's critical that we reject and prevent blasphemy laws from taking hold in the West. I have no desire to write or say something that some loon finds objectionable and then have my life or home damaged. The people that support blasphemy laws don't seem to realize that they are doing far more damage to Islam's image than any "Islamophobe" ever could. 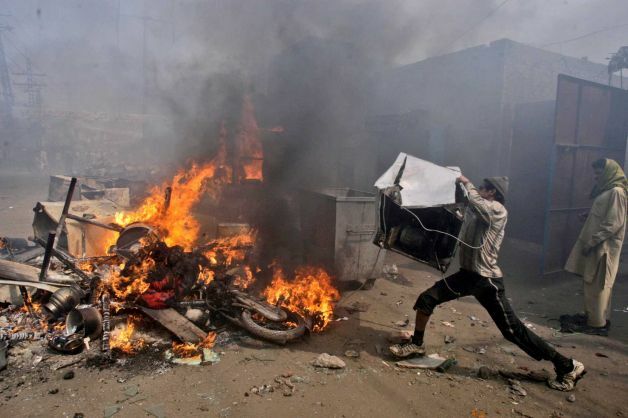 How often in the Mid-East or South Asia do you hear about Christian mobs attacking Muslim minorities because they said something about Jesus? Exactly.